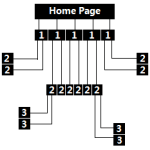 SEO Inner Link Structure. The SEO info I’m going to give you on SEO inner link structure is priceless. If website owners only new how important the internal link structure of a site was to a site’s performance on search engines, they would work on it day and night until it was done. By designing your SEO inner link structure the correct way you need far less inbound links than your competitors, and visitors and spiders will find more content. Page Depth. What is page depth? Page depth is the number of clicks it takes a visitor to get to a page from the home page. Pages that are 1 click away from the home page are considered more important than those that are further away and require more than 3 or 4 clicks to reach the page from the home page. If you have a older site then check the page-rank of each page, lets say your home page is PR3 if you have good content then any pages that are 1 click away will probably also be PR3 or PR2, the more clicks from the home page the less the page-rank, improve your SEO inner link structure by using this method. Now don’t go link every page to your home page. Select your main pages link them to your home page then link other pages from those pages, so any page on your site is no more than 3 or 4 clicks from your home page. This will create higher page-rank pages on your site. By designing your internal link structure this way those landing pages will also help to improve the home page, page-rank. What is an internal link? Internal links are links that go to pages with in the same website, in other words you place a link in the navigation menu or a hyper-link in the text content and the link goes from one page on a domain to a different page on the same domain. They help spread link juice (ranking power) around websites. Internal links are a great way for establishing site architecture and spreading link juice. Our SEO inner link structure is about building an SEO-friendly site architecture with internal links. A silo structure also improves your SEO inner link structure. What is a Silo Structure? You break your site down into different sections and create landing pages and in those landing pages you have a navigation menu with related pages to the landing page. Example: Look at this page the landing page is SEO Tutorials and this page is to do with SEO so the link for this page is included on the menu on the left, with other links in the menu about SEO. If a visitor clicks on the top SEO link in black they will be able to find all the content that this site has to offer on SEO by using the menu on the left. This makes it easy to find what you are looking for, more time spent on the site and improves bounce rate and page views. The more internal links your site has the easier it will be to navigate. When planning your main content always try to use hyperlinks in your content to other related pages, this will improve your SEO inner link structure and as visitors read your content if a link interests them they can find out more by clicking the link. Spiders from search engines will also use the link to discover more content on your site. Inner link structure is important and plays a vital role in search engine optimisation the more internal links you have that point to a certain page on your site, the more important search engines believe that page to be. To prove this nearly everybody that builds a website places a link on every page on their site back to their home page, making search engines believe that the home page is the most important page on your site because it has the most links pointing back to it. The more internal links that you have that point to a certain page, the more important search engines believe that page to be. How can your site benefit from this info? Does that mean you should have every page on your site include a link to every single page in your site? No. That’s an obvious red flag to search engines, your site will be seen as a spammer if your site has a couple of paragraphs and then 300 links to every other page on your site. Plan your site and and have a links to your home page and main landing pages from all your pages. Include a variety of anchor text never use the same anchor text or again it will be over optimised. When you design your navigation or place hyper-links in your content use long and short tail keyword phrases for best results and hyper-links in content use a variety of words that relate to the page you are linking to. Follow our SEO inner link structure on our site look at any link on my navigation menu or hyper-links in the main content follow that. You wonder will all the SEO Tutorials on this site make a difference to your site if you follow each one. The answer is yes. If you want visitors then you have to do some work, work hard on your site and overtime if you do it right you will rank well and get plenty of visitors. Think of SEO as a tune up on your car engine.